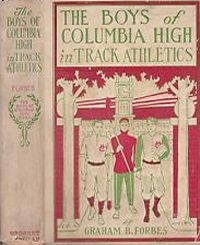 The eight volume Boys Of Columbia High series was created by the Stratemeyer Syndicate and initially published by Grosset & Dunlap from 1912 to 1920. 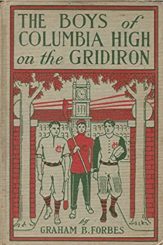 Later the books were reprinted as part of the Frank Allen series by Garden City Publishing Co.
"Never was there a cleaner, brighter, more manly boy than Frank Allen, the hero of this series of boys' tales, and never was there a better crowd of lads to associate with than the students of the School. All boys will read these stories with deep interest. 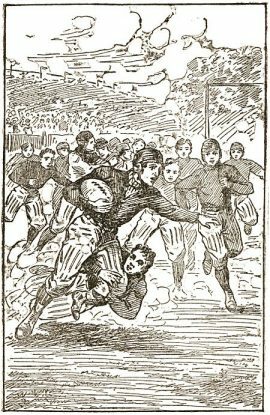 The rivalry between the towns along the river was of the keenest, and plots and counterplots to win the championships, at baseball, at football, at boat racing, at track athletics, and at ice hockey were without number. Any lad reading one volumes of this series will surely want the others." - Grosset & Dunlap advertisement. Illustrations: Frontispiece and 3 internals on coated paper. Dust Jacket: White coated paper, same picture as book cover. Same for all books except 8, which is duotone. 1-7 were reissued in this format.